Please call owner Scott at 317-752-2933. 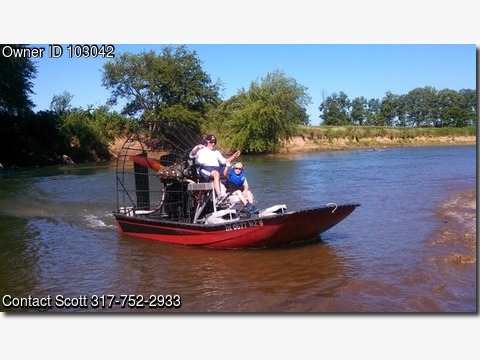 Boat Location: Indianapolis, Indiana, 17 Foot fiberglass airboat with Continental O-470 aircraft engine came off of a Cessna 210. Has dual high flow bilge pumps and batteries. Had fresh marine paint 3 years ago and has power to burn. Perfect boat for Florida everglades or Okenfenokee. Comes with updated cylinders that will need to be installed. Magnetos will need the points cleaned and serviced bc boat has been sitting for a while. The boat is currently located in Indianapolis Indiana and transport can be negotiated. Trailer was manufactured in 1982 VIN MVIN331761 IND, Title 10362158000002. Cash sale only, no checks, Paypal, Western Union, no pick up agents and no trades considered.